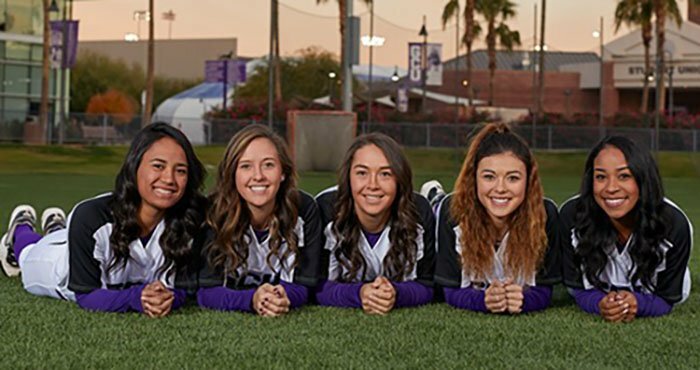 From left, Kama-Lei Santiago, Loriann Olson, Brianna Aguilar-Beaucage, Hailey Freeman and Jordan Keeton are in the sisterhood of GCU softball. There is a paradox about Hawaii: It is simultaneously a paradise and an isolated island. The increasing number of Hawaiian students who attend Grand Canyon University frequently experience the conflicting emotions of yearning to meet new people and exploring new places, yet missing their beautiful home. Those feelings were exacerbated in recent days. As Lopes from Hawaii were settling into campus life, their islands were hit by Hurricane Lane and torrential rainfall that set off landslides, flash floods and power outages. The students who prayed with Santiago comprise her GCU “family’’: fellow Hawaiians with a common concern and friends from Tucson, Buckeye, Utah and California. 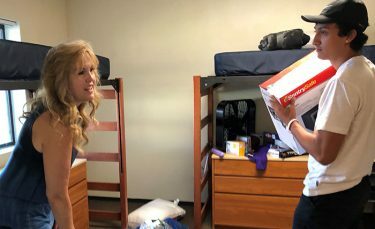 The second family she established at GCU eased her concerns about her first family. 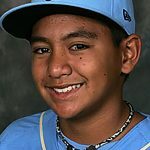 GCU’s own Pikai Winchester was the Little League World Series Most Valuable Player in 2008. That Hawaiian pride was apparent all over campus at watch parties for the Honolulu team, which claimed the Little League World Series on Sunday with a victory over South Korea. It also provided a welcome distraction from the storm. The last time a team from the islands won the LLWS, Pikai Winchester was the most valuable player — the same Pikai Winchester who wears board shorts to class, majors in sports management and is an infielder for the GCU baseball team. His love of surfing also is evident in the “hang loose” shaka symbol he flashes when he passes fellow Hawaiians on campus and socializes at Hui Aloha Club events. Among the surge of GCU students from Hawaii, Winchester stands out. People still remember his star turn in 2008. 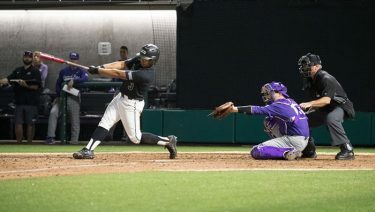 As a junior college transfer last season, Winchester was a hitting machine for the WAC champion Lopes, reminding foes from Fullerton to Champaign, Ill., of the precocious Little Leaguer from the 2008 Waipio (meaning curved water) team. The sweet left-handed swing of Pikai Winchester. A decade later, Winchester gathered with fellow Lopes from Hawaii, new friends he met at GCU, to cheer on the Little Leaguers from his native land. Across campus, three freshmen from Maui showed their island pride by hanging the Hawaiian flag in their suite. High school pals Kahai Bustillos, Kaimana Gerard and Ronson Iniba decided to enroll together and arranged to room together, along with a transfer from Kansas City. Michelle Bustillos, Kahai’s mother, leaned on other parents for the best strategy to move her son’s belongings 2,820 miles. 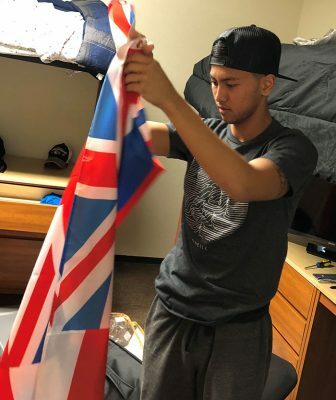 Ronson Iniba, a freshman from Kamehameha High School in Maui, unpacks his Hawaiian flag. Kahai believes the attraction of new experiences at GCU will outweigh possible bouts of homesickness. “I am OK with being so far from home because I know a lot of people who go here, so it makes it a lot easier,’’ he said. Being greeted by strangers who moved his pillows and pajamas into his room at Move-In was a novel experience. Michelle Bustillos helps her son, Kahai, unpack his belongings during Move-In. Inclusiveness is part of the attraction of GCU and the motivation behind the club that will remind Kahai of home, the Hui Aloha Club, previously known as the Hawaii Club. One of the club’s activities is cooking, which Winchester greatly appreciates since he misses the rice, pork and poi dishes from Honolulu. Freshman Teah Van Berden was dining at Chick-fil-A with her California suitemates when she was asked about her home on the Big Island, where rolling green hills dramatically decrease in elevation, dropping to the ocean blue. A surfer since age 10, Van Berden won’t allow Arizona’s landlocked nature to keep her off a monster wave. “That was actually my biggest concern coming here, but I am really hoping to make some road trips out to California every once in awhile,’’ said Van Berden, who was attracted to Lope Land because of the friendly atmosphere. “Everyone is so nice and welcoming here,’’ she said. Positive word of mouth and fun Discover GCU trips have enlarged the pipeline to more than 100 students from Hawaii. Kama-Lei Santiago is all smiles on campus and is also known to offer air kisses and shakas — the Hawaiian hang loose sign — to passing peers. Santiago freely admits to being torn between the islands and a life on the mainland, assimilating in the heart of Phoenix. “It is paradise, I’m not going to lie,’’ she said. “I miss it. I don’t get to see the beach and the beautiful sun going down into the ocean, and I miss my family and the food. But after 18 years there, I wanted something new. I wanted to meet new people and I wanted to see the world. 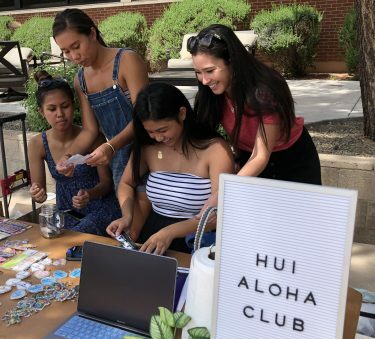 From left, Tristyn Torbio, Emma Pilotin, Cherise Magsanide and Rachel Kawakami set up a welcome table for students interested in Hui Aloha Club. As a member of the Lopes softball team, Santiago has traveled to road games all over the western part of the mainland. Moreover, she established close connections with an entire team of people. She calls all of them “sisters,’’ and several are among her closest friends. “The day I made the team was probably the best day of my life,’’ said Santiago, who made the team even though she was not recruited. 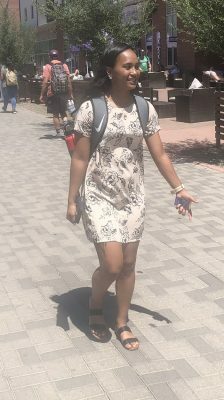 A communications major, Santiago traverses campus in a floral dress and a backpack filled with books, exchanging greetings with a variety of students. Among the Hawaiians, a loud air kiss is common. “When you hear the kissing noise, you know that’s them and they look back at you and give a little wave or a shaka and you will know that it is family,’’ she said. Non-Hawaiians don’t get bussed, but they are curious.